I have found the Great Lakes Brewery's Christmas Ale. In other words, I have made it back to my homeland of Cleveland. Because I grew up in Cleveland and have many friends and family there, I feel at home most in this beautiful and gritty Northeast Ohio city. However, I must say that my time here comes with a price as difficult questions arise. When will we play Texas hold 'em? Should we go to the Browns game or watch it on TV? What will we do if the game is blacked out? 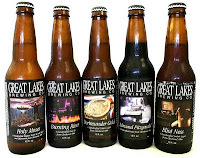 Although it may not be proper to escape these hard questions with liquor, the Great Lakes Christmas Ale offers a way to put these queries into perspective with a beverage that is 7.5 percent alcohol. 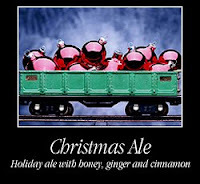 Some people apparently have a hard time finding the Christmas Ale because of its enormous popularity. But in certain suburbs, Brecksville included, it appears to be easy to get. http://blog.cleveland.com/metro/2009/12/christmas_ale_it_tastes_like_c.html, and I learned that the Christmas Ale accounts for 20 percent of the Great Lakes Brewery's sales, even though it is only sold for two months. Dortmunder is the most popular with 35 percent of the sales, and I think I like Burning River Pale Ale the best.